Shop for authentic Samoa Flags. We offer indoor and outdoor Samoa flags in durable nylon. Our outdoor flags are finished with a canvas heading, while indoor flags are finished with a lined pole hem and your choice of with or without fringe. We also offer indoor and outdoor Samoa flag sets. 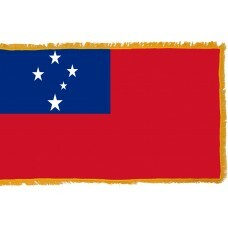 The Samoa Flag consists of a red field with a blue rectangle in the top left corner. The blue rectangle contains the "Southern Cross" which is four big white stars and one small white star. 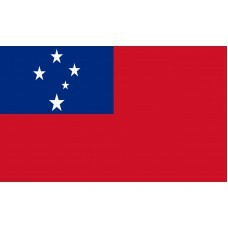 The blue color represents freedom, the red color represents courage (as well as being the Samoan traditional color), and the white color represents purity. The Southern Cross represents the connection that Samoa still has with New Zealand (as it is also part of New Zealand’s flag) and it represents Samoa’s geographical position. The Samoa Flag was first adopted on February 24th, 1949, even though it was still a territory of New Zealand. At that time, there were only four stars on the flag. When Samoa gained independence from New Zealand, the same flag was used, and an extra cross was added to it. When Samoa was a German Colony, the flag that was used was a black, white, and red tricolor that had an Imperial Eagle on it. Samoa has had 7 different flags throughout its history. Samoa is an island country that is located in the Pacific Ocean. The capital, and largest city of Samoa is called, Apia. Samoa is made up of 9 volcanic islands, with the two major ones being, Savai'i and Upolu. Savai'i is the largest island and is still volcanically active. The first European to reach the island was an explorer named Jacob Roggeveen in 1722. In 1778, the French Admiral, Louis de Bougainville visited the islands and renamed them the "Navigator Islands" due to all the canoes of the Samoans. In 1899-1914, the Germans took control of the islands. In August 1914, at the beginning of WWI, New Zealand took control of the islands from Germany, following Britain's request to "perform this great and urgent imperial service." During WWII, New Zealand administered the islands until Samoa gained independence in 1962. Samoa and New Zealand, despite independence, still have very close ties today. Samoa's economy is mainly reliant on agricultural exports and fishing, with its main export being tuna. It has not been classed as a major tourist destination despite the beautiful attractions that it is home to. The Lalomanu Beach is the most popular beach in Samoa due to the views, especially of the smaller islands' and its white sand. The "Sua Ocean Trench" is a major swimming spot that attracts the few tourists and is known as the "swimming hole." The swimming hole is a result of the eruption of the volcanos that caused the majority of the ground to fall away resulting in the 30-meter deep hole. The swimming hole can only be accessed by the use of a ladder. The "Afu Aau" waterfall (also known as the Olemoe Falls), is a waterfall that descends from the rainforest into a swimming pool.